Oh my gosh you guys! I just got back from the most awesome thing ever....we officially went lure coursing. The Tri State Jack Russell Terrier Club had an all breed Funday today, and there was racing, go-to-ground, weiny bobbing and, lure coursing. 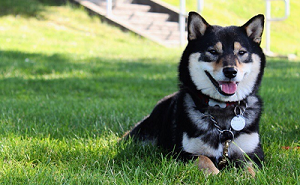 I hate that my internet connection at home is so slow, because I have to wait to upload the neato video I got of Beebe the Shiba Inu ripping up the track until later. It was cool. I didn't realize my vid cut out right after she launched off. Hope this posts ok.
Yeah, I finally figured out You Tube! Here's a vid of one of the JRTs doing a run, another dog broke loose onto the field. It shows some of the equipment used. We also tried the agility set up, and the dogs were too distracted for the weiny bob. They had a little go-to-ground course for Earth Dog stuff, and were using a rat to turn the dogs onto it. Those terriers were intense once they smelled the rat. Ah crap, I have to reload them. Awesome! That looks like so much fun! I wish there was a lure coursing group round here. That is so cool, glad you guys had a great time. Bumping this since I'm interested in lure coursing with Sagan! Since you're around the Washington area @lindsayt, would you recommend the Cascade Coursing Club? Or is there any other place/club that you recommend going to? I've noticed that they hold trials for those who are interested, but it seems likely that they only hold them for hound breeds. I'll email one of the coordinators in a bit about it, since I have some time (the next trial there isn't until April anyways). For anyone else who's done it, how was the experience overall? I took my Kai Ken to an earth dog event in the fall--with lure coursing. It was super fun, and he had a great time, and really just wanted to run every single run. I'd absolutely do it again! Cool stuff! I guess that seals the deal, then. I'll be looking into it. Loved the video and was envious of the beauty of the setting. I love South Florida but I do miss the mountains of Las Vegas area and the open fields of Wisconsin. Let us know how it turns out. We are lucky to have a lot of CATs in this area. The hound people are also very nice to work with. @Lindsay...when I first saw this thread resurrected I was so confused--I thought Lindsay's been lure coursing before, and I know she knows how to post videos! :)) Then I looked at the date! Kouda completed his first CAT today! We had done one informal coursing day back in February, and Kouda was all over that, so when we were invited to tag along with Kouda's pack of Dobies, we said "SURE!" Passing a CAT (Coursing Ability Test) is relatively easy - the dog just has to finish the 600 yard course with enthusiasm under 2 minutes. Three CATs will earn you the first title. I'd recommend anyone with a drivey Shiba try it out! Kouda wanted to go again immediately, so we stuck around and did a second run at the end of the day (not recorded). For those curious how a Shiba compares to larger breeds, here's 2 Dobermans and a Greyhound. So after watching Kouda's lure coursing videos again...(yes i'm bored at work). I've decided I will be taking Bootz and Jackie to lure coursing on June 15th! Jackie's prey instincts have been kicking in. She use to be 100% reliable off leash, but now she's about 90% ...the 10% being if she sniffs/hears a cat/squirrel, she will want to chase it. Bootz is good offleash, she's obedient and will leave the cats/squirrels alone after i give her the "leave it" command. I think any dog with prey drive would enjoy lure coursing. For first timers, I would recommend you go to a "fun run" event rather than an actual trial, because trials cost more. Fun runs usually are shorter, and you get to go multiple times. Or find a hound club that holds open practice runs. Kouda's introduction was a straight run at the place we went sheep herding. When you get there, let the dogs watch what is going on, and see other dogs run. Their interest should be obvious. ;) If they get too amped up, take them away to calm down before their turn. Once it is your turn, tell the operator it is the dog's first time, and they will take it easy and slow down and jiggle the line to keep interest. Some dogs have less interest in the plastic bags, so they may attach a fur lure. I was concerned about catching Kouda at the end, but he is so fixated on the lure that he doesn't run off. Releasing him is harder (as you can see in the video). I am still learning releasing technique, and have ordered a coursing slip lead that releases with a tug. I've read that you can straddle the dog to keep them still, with pressure on their thighs. The video of the greyhound is like this. As for health conditions, I'm not sure. I would be cautious to be honest, but talk with your vet and tell them what you are doing. @lindsayt might have some suggestions too, because Beebe was still able to enjoy sports. Are you going to the run in Aptos by chance? Too bad @tatonka can't make it, but they do have runs monthly, so you can go again next time. What about @kumaDUDE? haha. That reminds me... from the videos on their site, the field appears to be fenced, but IF Kuma goes you'd probably want to make sure! Lol! I suggested it to kumaDUDE but he reacted the same way as you regarding the offleash + not fenced in = kuma go bye bye. @Tatonka actually just responded to me today. He will be joining me on June 15th for the lure coursing. Hopefully if anybody else in the area want to join ;) that would be great. It will be Tatonka's first time as well! Maybe I can bring Maya to the next one. Hopefully you guys would like to go again too. Beebe is now retired from Flyball and Lure Coursing and Agility. She has HD but her knees are solid, although she is hypothyroid and that can predispose her to torn ACLs. She takes Solid Gold MSM, Fish oil and Dasquin. I would be cautious with doing rapid twists and turns with dogs who are overweight, have bad knees and or HD. Doing warm ups and not running cold is good practice. Maybe consider pet health insurance that covers blown knees and FHO. Beebe has the heart of an athlete and desire to work till she drops, but her little body just won't let her. We do other lower impact things now like Barn Hunt and obedience practice. @Bootz, thanks for sharing the info, I'll look into the schedule. @lindsayt, thanks for the reminder. Any recommended warm up exercise for the dogs? I'll definitely bring it up during the vet visit to make sure bootz and Jackie get the green light! @Bootz, @kumaDUDE, if the field is fenced, go for it. It's no different than Kuma at the dog park - he will return to where the action is. I also bring a squeaky toy and treats for Kouda, but he doesn't need it. Couple more tips - you might want to bring a crate for your dog to decompress in between runs, and plenty of water. For the summer months, bring shade, and a cooling pad if you have one. Fun runs are less strenuous than trial runs, but injuries can still happen if the dog trips over a line or makes a bad turn. Check them over afterwards. Warm ups - get them moving to stretch their legs, like an easy jog. Or a light game of tug. I usually give Kouda a quick potty walk beforehand, and he usually goes. Don't forget to cool down the dog after a run as well. Ahahaha. Worst come worst you can drive to my place in San Jose, and we can carpool down. Edit to add: Tatonka and I are shooting for a 10 am arrival. (We are going in separate rides) So far we have 2 Shibas, 1 Husky and 1 Shihtzu mix from our group. @bootz -- I wish I could, Kiba loves to chase prey lol. Unfortunately his recall is still a work in progress. I hear this a lot from Shiba folks. But honestly, at all the lure coursing events that I've been to, not one dog has run off. The lure is very effective at keeping dogs focused. Instead, dogs that have gotten loose run to the field, not away. When the lure stops, Kouda is on it, and I often have to redirect him off it with a squeaky toy. Some dogs run in circles around it at the end, but the operators can still move it back and forth to draw them in. I guess one more tip I can add, when the run is over and the lure stops, let your dog grab, bite, pull it. Praise them for it while you approach to collect them. They caught it! If they are satisfied, it will make the game more fulfilling for them. Likewise, if your dog makes a lot of noise while watching and waiting, don't discourage it. It's a natural indication of drive, and inhibiting it is counterproductive to the sport. If your dogs gets too worked up (like Kouda) take them further away so they can't see it anymore. @Zandrame thanks for the tips!! I'm so excited. It will be a good laugh if bootz/Jackie/Tatonka stops half way. @Mayama no worries! I'll keep you and @kiba888 posted with videos and photos in case you guys want to go next time. Ok so :( unfortunately Tatonka and co couldn't make it. But my husband and I decided to go anyways to try. Hahaha she started off slow, but yeah she's a natural. I guess all those times where I played tagged with her and ran away paid off! The field was different than what i expect (from Kouda's video) but I kind of like how simple it is. No sudden change in direction, which makes it easier on their joints. :) Too bad they're skipping July...but we will be back for August!! @Tatonka @Mayama let me know if you guys are interested for the August run! @Bootz, thanks for sharing the videos! It's nice that they allowed Jackie and Bootz run together. So cute! I'm surprised that the field looks very different than the ones I saw before too, but I guess this is a good place to start for first timers. Count us in for the August run! I spent all day trying to find a lure course in central florida. I was able to find a group but they don't do runs in the summer >_< I', guessing because of the heat. Can't wait until I can try just worried my dog will slip under the temporary fence. Oh gawd that would have been fun. Demmit. The "AKC Coursing Ability" one seems to be open to all breeds. Edit: Just read the fine print. Seems like each dog can only run once at the event. Maybe we should try the one you went to first, as this will be Maya's first time. @Mayama, yes! That is an official AKC Coursing Ability Test (CAT) like we did with Kouda, open to all AKC registered breeds. Looks like it's in Hollister. The premium (registration pdf) says it's $20 pre-reg. With potential $5 practice runs if daylight permits. This would be the full 600 yards (or 300 yards for small dogs like Jackie). I don't know if dogs need to be registered for the practice runs, but for the tests (and titles) they do. I would contact the listed folks with email for further information. @Bisu_kun Zandrame was right on the dot when she mentioned that dogs don't run off the field, they run on to the field. Surprisingly with Bootz and Jackie.... Jackie is normally very good with recall but the lure coursing made her prey instincts go crazy, so she didn't comeback to me, she kept looking for the lure. The people that set up the event just move the lure back and forth to attract her attention, then moved the lure close to me so I can catch her. Bootz did very well. Of course she didn't listen to my husband, but her recall was solid with me. She stayed when I told her to, so we can put the leash back on her. @Mayama, yeah start off slow first! try the simple ones, then if you're interested we can do the CATs. I might be interested in doing it with Jackie, since I originally wanted to do agility with her. But i'll have to register her with AKC first! @Zandrame ;) now I have to time Jackie the next time we run, to see if she has potential! So, correct me if I'm wrong - then an AKC registered dog can participate in events like those regardless of whether or not the registration is full or limited correct? I've never had a purebred with papers, so I'm a little dense when it comes to things like this. Thanks for any input! AKC limited or full is allowed of course. Kouda is limited and neutered. Zandrame covered all the bases. As she stated, anybody can participate, but the links she provided depends on your dog. Jackie is a ShihTzu mix so she has to be registered with AKC Canine Partners. I'm assuming you guys are registering your Shibas, so you can do a full registration or limited registration with AKC.